As a key contract manufacturer for an industry leader, we have been selected as the single source supplier of weldments which are the core of this customer’s Class-8 Semi Trailer Axle Assemblies. This case study showcases one of the newest designs. Our support for each program has begun by collaborating with customer engineers to review preliminary designs for manufacturability. Our engineering team then works closely with our customer’s staff through several phases of prototyping and FMEA validation. PPAP is then submitted and full production approved. As the critical component supplier, we are responsible for the complete process; steel acquisition through manufacturing of sub-components and final assembly robotic welding to customer supplied beams. Because of the tight tolerances required of safety related dimensions, combined with 1,020” of welding per assembly, controlling weld distortion is the biggest challenge to overcome. We’ve repeatedly solved that by utilizing dual arm robotic welding cells and advanced programming techniques including Twin Synchronous Coordinated Motion with High Deposition weld parameters. Productivity and quality is also increased through simultaneous robotic welding in a gravity-neutral plane while the axle is rotated by a 7th axis controlled by the positioner. All of the multiple stage weld fixturing is designed and produced in house. 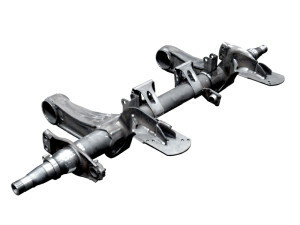 Based on the intense initial design program, supported by our industrialization success, this trailer axle program has now grown into (3) different models with (27) production variations. 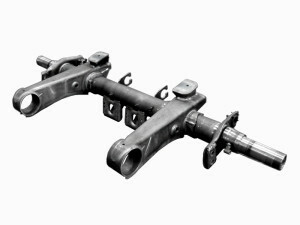 Product Description – Class 8 Semi Trailer Rear Axle Weldment. Materials – High Strength Low-Alloy (HSLA) steels – grade 50 & 80, DOM tube, 1/4″ sheet, 1/2″ plate, 1/4″ coil stock. Tightest Tolerances – +/- .030″ and GD&T to 0.040″, without machining. 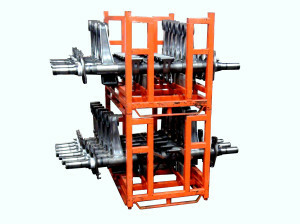 Quantities – Production lot sizes of 10 pc to 200 pcs per configuration. Inspection – Dimensional using Faro Arm CMM, Welds to AWS D1.1 and numerous customer specs, AWS Certified inspection – Fillet gauge and visual ND, initial and periodic Macro-Etch.